Public safety is a critical and necessary investment for every community. 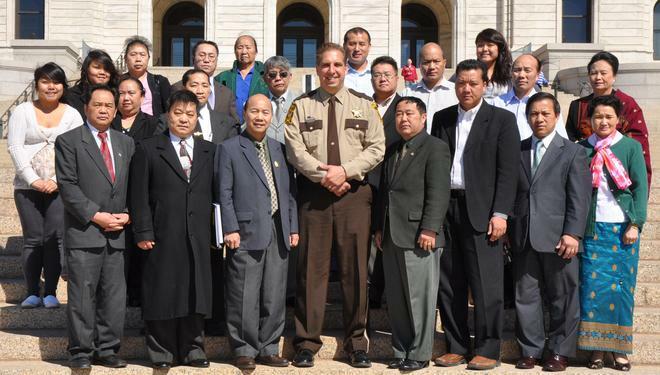 That’s why professional management and leadership of the Ramsey County Sheriff’s Office is imperative. Everyone—including citizens, employees, and community groups—must have trust and confidence in the Sheriff’s Office. In 2019, the Sheriff’s Office budget will total $58.6 million. Compared to just four years ago, this represents an increase of nearly 14% or $7.2 million. There are also 435 full-time employees represented by seven labor unions who serve our community. Leading an organization this large and complex requires an experienced professional who has community ties. It is important to pause and recognize the current interim sheriff was appointed in a process that lacked transparency and community input. Unlike other appointments for police chiefs, this was not an open process and there was no search for the best candidate. Qualified candidates—including women and people of color—were ignored. Despite these issues, the interim sheriff still requested salary increases for himself. Between January and December 2017, the interim sheriff increased his salary 15.5%—that’s $21,317—to total $159,822. Neither the sheriff nor chief deputy have any experience working in or supervising a jail operation. Combined, they have less than nine years of experience working at a sheriff’s office. Form an Advisory Board. To reestablish the Sheriff’s Office as a leader and guarantee services are provided consistent with community values, I will draw on a “Team of Experts.” Team members will reflect the diversity of the county and help shape the direction of the Sheriff’s Office. This includes delivering on the Public Safety Agenda for 2020 and advising on procedural justice matters. Meetings will be open to the public and minutes will be posted online. Engage with all community groups. Ramsey County is the most diverse county in the state. The Sheriff’s Office will start meaningful community engagement efforts that are inclusive, inviting for all citizens, and effective in accomplishing community goals. The Sheriff’s Office will work alongside all residents, schools, non-profits, and businesses to improve the safety and livability of all neighborhoods. Be present at labor management meetings. I will attend labor management meetings with all labor unions to discuss issues, seek input and suggestions, and answer questions. I will abide by labor contracts, respectfully use management prerogative, and achieve mutually beneficial resolutions. Resolve labor contracts on time. The Sheriff’s Office will be committed to protecting the interests of citizens and working with labor unions to start contract negotiations on a schedule that allows for resolution and agreements in a timely manner. This provides peace of mind to employees, taxpayers, and administrators. Proactively address budget and staffing issues. The Sheriff’s Office will stay on top of management issues. This will prevent negligent budgetary overruns, emergency funding requests, and even more staffing crises. We must do this to ensure public safety and community expectations are met. Through proper budget management, transparency, and incorporating data into decision-making processes, the long-term stability of the county will be maintained. An annual management report will be published. This report will highlight the Sheriff’s Office progress on restoring professional management with a focus on community service, labor relations, and transparency. Thank you. Have you been subscribed to the mailing list.